Beautiful, huh? 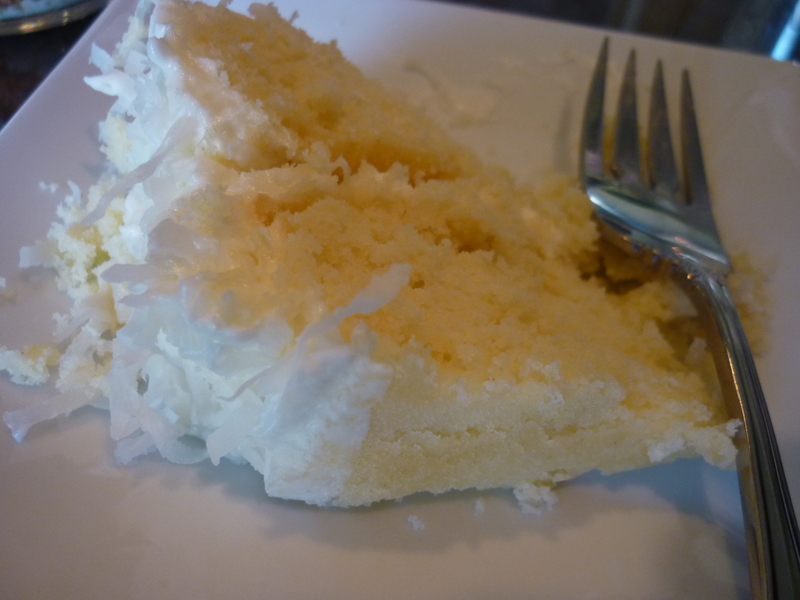 Dreamy coconut cake. I finally made one! Confession time: I am not that great at making cakes. It’s always a challenge for me to get it right, and often times when I bake a cake it’s my family who is the Guinea pig. So, if I get a “Mmmm!” when someone tastes my cake, I know I’m on the right track. When my father (who is a retired baker) complements me on my cake, I’m very happy. 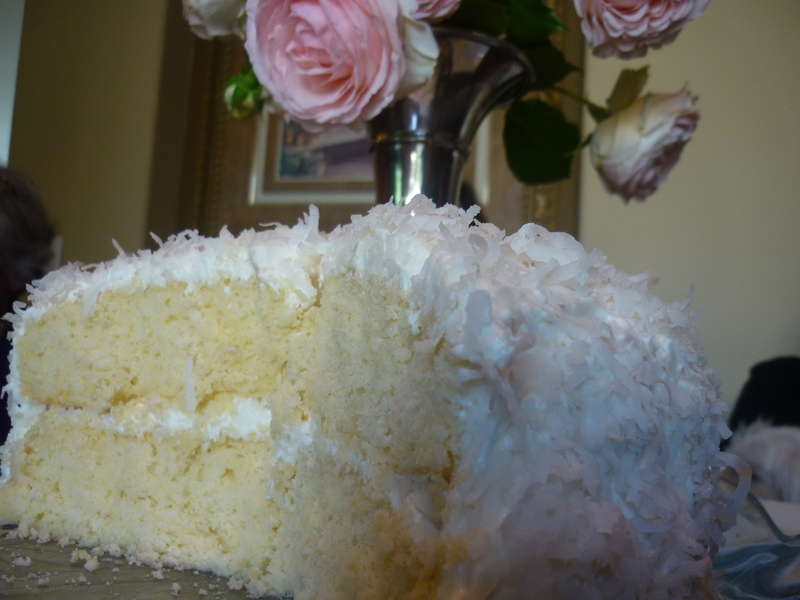 Well, for Mother’s Day this year, I baked my #ExtraordinaryMom a Coconut Layer Cake. Guess what? I got lots of “Mmmm’s,” and my father said it was good. Seal of approval. I should be happy. I’m not. I’m just a little…indifferent about this cake. It has good coconut flavor, but it’s a little too dense for me, and I’m not sure if I like the cream cheese in the frosting. At first I wasn’t going to share it with you, but since I got so many good reviews from my family, I thought I should share it just as well. 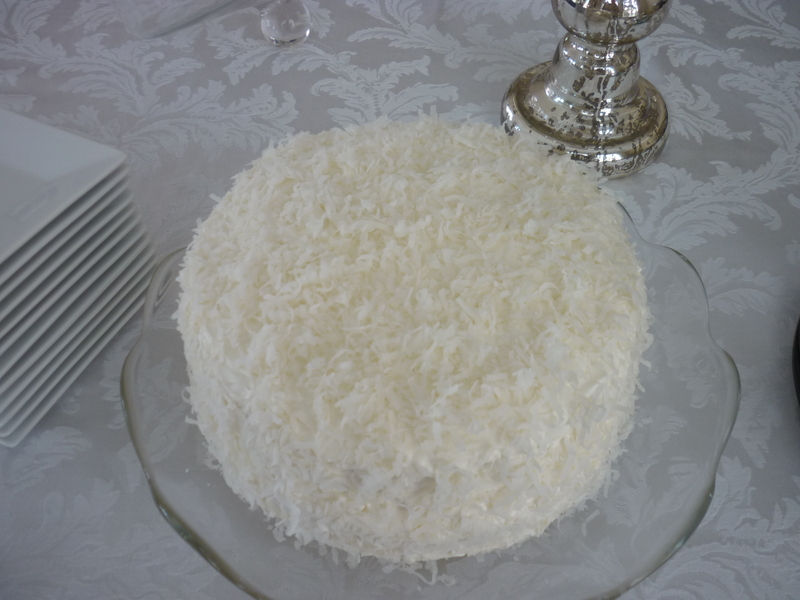 If I find a better coconut cake recipe in the future, I’ll let you know. Maybe my family was just being nice. Ha! I got the recipe from the book, The Bon Appetit Cookbook. If you visit their website, for some reason you will not be able to find this particular recipe, although they do have others. For cake: Preheat oven to 350 degrees F. Line bottom of two 9-inch diameter cake pans with 2-inch high sides with waxed paper. Sift flour, baking powder, and salt into large bowl. Using electric mixer, beat the butter in a large bowl until smooth. Gradually add sugar and beat until light and fluffy. Add egg yolks 1 at a time, beating well after each addition. Mix in vanilla coconut extracts. Reserve 1/4 cup coconut milk for frosting. Add flour mixture to butter mixture alternatively with remaining coconut milk, beginning and ending with flour mixture and beating until just combined. Using clean dry beaters, beat egg whites and cream of tartar in another large bowl until medium-firm peaks form. Fold 1/3 of whites into cake batter to lighten, ten fold in remaining egg whites. Divide batter equally between prepared pans; smooth tops. Bake cakes until tester inserted into center comes out clean, about 30 minutes. Transfer cakes to racks. Cook in pans 15 minutes. Run small sharp knife around pan sides to loosen. Turn cakes out onto racks; peel off waxed paper. Cool completely. (Can be prepared 1 day ahead. Wrap tightly in plastic and store at room temperature). For Frosting: Using electric mixer, beat cream cheese and butter in large bowl until smooth. Gradually sift powdered sugar over, mixing until well combined. Gradually add enough of reserved 1/4 cup coconut milk by tablespoonfuls to make frosting spreadable. Place 1 cake layer on platter. Tuck waxed paper strips under cake to protect platter. Spread 3/4 cup frosting over top. Sprinkle 1/2 cup coconut over. Top with second cake layer. Spread remaining frosting over top and sides of cake, covering completely. Remove waxed paper. (Can be prepared 1 day ahead. Cover with cake dome and refrigerate. Let stand at room temperature 2 hours before continuing.) Decorate cake with pansies or fresh or candied violets, if desired.